Justice Elena Kagan [back row, far right], whom Stephen Totilo said "did seem to get it" during oral arguments in Brown v. EMA, called the case the most difficult of the Court's most recent term, one in which she felt she was constantly in the wrong no matter her current state of mind. Ultimately, Kagan, the Court's newest Justice, joined the 7-member majority striking down the 2005 California statute that would have banned the sale of violent video games to buyers under 18 years of age and set fines for violating the law. But she did not arrive at her decision easily. "It was the case where I struggled most and thought most often I'm on the wrong side of it," she said in an appearance at the Aspen (Colo.) Institute on Tuesday. "You could see why the government would have wanted to do this and you can see the kind of danger it was worried about, the kind of effects these extremely violent video games have on young people." While she understood the state's interest in crafting the law, she could not reconcile it with the Constitution. "I couldn't figure out how to square that with our First Amendment precedence and precedence is very important to me," she said. "I sweated over that mightily." Kagan added that the Court is "extremely protective of the First Amendment and extremely protective of speech. 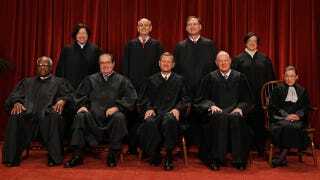 There is no question the court has a very expansive view of the First Amendment." Justices Clarence Thomas and Stephen Breyer were the only ones to vote in favor of upholding the California law. Kagan was part of a five-member majority opinion, joined by the concurring opinion of Justice Samuel Alito and Chief Justice John Roberts, invalidating the law.